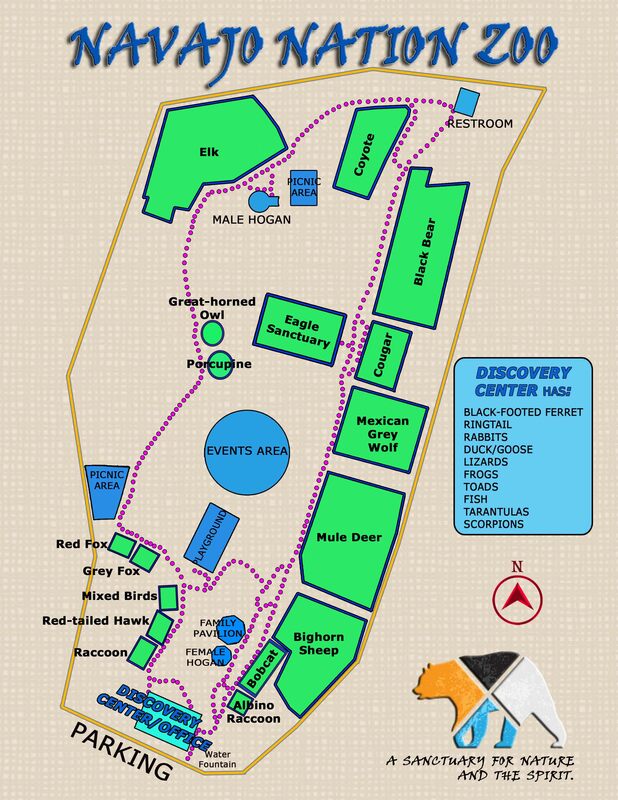 The Navajo Nation Zoo currently has a number of Zoo-improvment project planned for which we have not identified funds. Some of these projects will create an improved Zoo experience for its 35,000 to 40,000 visitors each year. Projects such as shade structures for the playground will benefit adults as they watch their children play. New wire mesh on the animal enclosures will provide a more direct viewing experience. First Aid equipement such as Automated External Defibrillators will give Zoo staff the equipment needed in emergency situations. Of course, the Navajo Zoo offers full sponsorship recognition. We will install a permanent sign with your name associated with the completed project. Projects available for sponsorship vary greatly in price; for a complete list of project available for Project Sponsorship, please follow the Contact Us links. We are very grateful to El Paso Corporation for providing most of the funding, and Gallup Lumber & Supply Inc. for the remainder of funding to replace the east Discovery Center Doors! We are very grateful to the Navajo Nation Dept. of Fish & Wildlife for funding the replacement of the west Discovery Center Doors, and to Murphy Builders, Inc. for installation of these doors! The Department of Fish and Wildlife along with assistance from Murphy Builders and Merrill Fence Company of Gallup NM provided material and labor donations to help provide the Navajo Zoo with its new Bighorn Sheep enclosure early in 2012. And finally, the Navajo Guide Association provided the funds for the replacement of the final Discovery Center Door during the 2012 Department of Fish and Wildlife Sportsmen’s Expo. Thanks NGA! The Navajo Nation Telecommunication and Utilities Department graciously donated funds in 2012 to have Holiday Nursery in Gallup NM provide landscaping services to the Zoo. They along with plant donations and landscaping assistance from Joe Pacal of Ft. Defiance AZ jumpstarted the development of botanical gardens at the Zoo. The Navajo Division of Transportation provided donation of material and labor for a much-needed improvement to our parking lot and entry road. The staff of the Navajo Zoo greatly appreciate these project sponsors!